A Guitar Named Bob – Make It! Create It! Learn It! I’ve got the blues…those cold winter dark day blues! Brrrrrr. Do you know what is a great cure-all for that tooth numbing chill that makes it feel like it’s minus 22 instead of minus 12? Music. Sweet, sweet music. Here at the Create It! Space in the Civic Centre Resource Library we happen to have a lot of that to go around. Case in point. Meet Bob. Dylan that is. Our newest member of the Create It! Space Guitar Family. 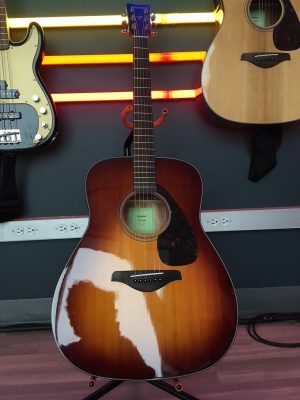 An acoustic Yamaha guitar that has a great sound for strumming and a folksy twang that will transport you far away from the blistering cold to the warm soundscape of rambling tumbleweeds. If this is your cup of hot chocolaty goodness then make sure to reserve your spot in the Recording Studio today!